18 November 2016 – Mohammad al Qahtani is a former economics professor and one of the principal visionaries behind the Saudi Civil and Political Rights Associations (ACPRA). 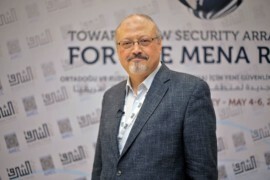 On 9 March 2013, a Riyadh criminal court sentenced him and fellow ACPRA co-founder, Abdullah al-Hamid, to ten and eleven years in prison respectively. Al-Qahtani’s sentencing and imprisonment is the result of his tireless work advancing human rights in Saudi Arabia which today still inspires many Saudis. Born in Saudi Arabia in 1965, Al Qahtani and his family came to the United States in 1991 where he studied and received his PHD in economics from the University of Indiana. In 2005 al-Qahtani became an economics professor at the Institute of Diplomatic Affairs in Riyadh. Despite his personal security as a respected academic at a government school, al-Qahtani became active speaking out against the violations of the government and using his platform as the host of a weekly economics talk show to demonstrate the link between economic development and political reform. In November 2008, al-Qahtani was among 20 human rights activists who started a two-day hunger strike in protest against the imprisonment of 11 activists without fair, public trials. In 2009, al-Qahtani co-founded the Saudi Association for Political and Civil Rights and became the organization’s president in 2011. As a part of his work with ACPRA, al-Qahtani helped the families of arbitrarily detained prisoners file complaints of violations of Saudi law with the kingdom’s Board of Grievances. Al-Qahtani and his ACPRA colleagues also worked with the United Nation’s human rights mechanisms, communicating information on cases of Saudi human rights violations to the Working Group on Arbitrary Detention (WGAD) and other Special Procedures. Not only is al-Qahtani one of Saudi Arabia’s most prominent advocates for democratic political reform, he also stands out as an ally of Saudi Arabia’s women’s rights movement. Al-Qahtani was an active supporter of the Saudi women-led, Women2Drive campaign which called for Saudi women’s right to drive and encouraged Saudi women to drive in collective protest on 17 June 2011. That day, Al-Qahtani sat in the passenger seat as his wife Maha joined the demonstration. He then tweeted, “My wife, Maha, and I have just come from a 45-minute drive, she was the driver through Riyadh streets.” In a subsequent interview, al-Qahtani said he was proud of his wife for deciding to drive. In March 2012 authorities began question al-Qahtani and al-Hamid. Their trial began in in the Riyadh criminal court in June 2012 where al-Qahtani faced charges him that included, among other things, “setting up an unlicensed organization” and “accusing the judiciary of allowing torture and accepting confessions made under duress.” Ingeniously, al-Hamid and al-Qahtani demanded an open trial- creating an opportunity to publicly respond to the charges against them. As their trial began al-Qahtani tweeted, “the government wanted to intimidate us by putting us on trial, so we have decided to put the government on trial!” Over the course of his trial hearings, al-Qahtani deftly defended against the accusations against him and in doing so delivered lectures on the importance of civil rights and political reform in the country. On 9 March 2013, the criminal court sentenced al-Qahtani to 10 years in prison and a further 10-year travel ban. He is serving his sentence at al-Hair, a maximum security prison near Riyadh where he has been subjected to various forms of maltreatment. He remains detained in the prison’s drug ward however, his legacy fighting for political reform continues to inspire human rights defenders and civil society activists across the globe.